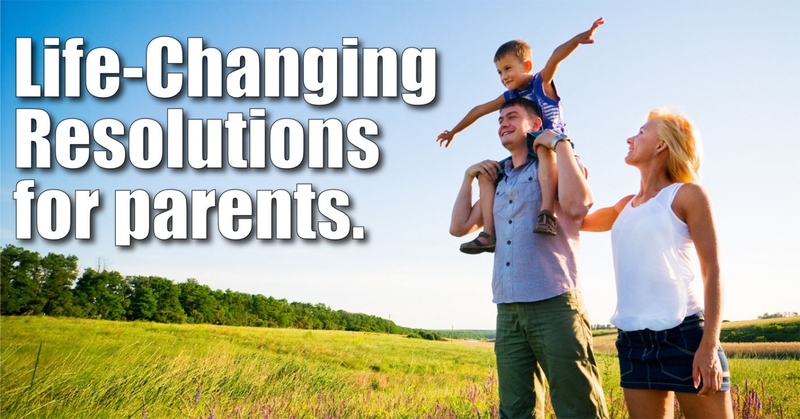 10 life-changing resolutions for parents. The arrival of another year brings a fresh opportunity for parents to establish new habits to strengthen their families. Here are ten resolutions that get to the heart of what parents should focus on for 2010. Americans are now working more hours than any other industrialized country. Regardless of your job or the economy, it’s key to remember that what our children need most from us is not a bigger house, a newer car or the latest electronic gadget, but whatever time we can give and a genuine, caring relationship. Your children measure your success as a parent not by what you buy, but by your love and commitment to them. Show your love tangibly by prioritizing family dinners at least four times a week. Schedule a family activity for a few hours each week, or at least once a month. Within the parameters you set, let kids take turns choosing the activity, such as going bowling, playing mini-golf or cooking brunch. Most families follow a school-and-work schedule that hinders spontaneous trips and outdoor adventures. And the prevalent concern for protection has led many people to label the current generation of parents and their kids as anxious and averse to outdoor play. However, over scheduling and over sheltering can cripple children with fear and limit their experiences. Plus, technology isn’t helping much in enticing kids to explore the great outdoors. Give your kids challenges and adventures to stretch their abilities and develop self-confidence. Break up your family’s routine. Go on a weekend camping trip, climb a mountain, raft down a river, learn to surf. Build into your family’s schedule at least one outdoor adventure every month. Trust what is real about parenting, not what you feel about parenting. Nothing is closer to our emotions than parenting. Recognize that our emotions and our sense of fulfillment will fluctuate from day-to-day. On a good day, you’d proudly wear a Parent of the Year tiara. On a bad day, you’d rather be raising orchids than kids. But the good news is that the value of parenting is not determined by how we feel about it. What matters is what’s true and real. Our children are given to us as gifts and responsibilities. They are of inestimable value. We get to make a difference in the world by making a difference in them. Help your kids set long-term goals, such as attending college, taking a special trip, making the football team, buying a first car. Start a savings program (or a healthy fitness program) with your children and stick to it. Keep in mind that it’s easier to abstain from immediate gratification when it threatens a highly desired goal. Some parenting programs and formulas, even if they sell millions of books, promise to make the task of raising kids easy and convenient. But most of us didn’t have children for convenience. Resist the temptation to follow someone else’s one-size-fits-all formula. Remember why you had children in the first place. Celebrate the uniqueness of each child, and the chaotic, thrilling ride of parenting. Be open to new information. And always measure others’ parenting advice (including this article) with what you know about your children. No one knows your kids or has as much invested in their future as you do. Teach toward the long-term good. In our consumer culture, many people lose the ability to distinguish between need and want. Our kids are especially targeted by the most creative minds in advertising to crave and buy the newest and coolest things. Parents, too, can be convinced to give their kids what they want, contributing to Internet and gaming addictions, childhood obesity and other ills. One of our primary jobs as parents is to model our own distinction between immediate gratification and the long-term good, and to equip our children to do the same. Acknowledge your feelings of frustration when challenges arise. However, avoid focusing on guilt and negativity— either toward you or your child. Be mindful that your children are here to contribute to the world in a meaningful way. Along the way, they are prone to mess up or cause a conflict in learning how to be the best people they are destined to become. The most recent book by Leslie Leyland Fields is “Parenting is Your Highest Calling” And Eight Other Myths That Trap Us in Worry and Guilt (WaterBrook Press). She lives in Alaska with her husband and six children, ages 6 to 21. Visit Fields online at www.leslie-leyland-fields.com.